42 degrees Celsius was the forecast temperature for Saturday the 11th of February in Echuca for the first day of racing at the 2017 Southern 80. The Southern 80 is the worlds largest water skiing race with people travelling across the globe to both compete in the race or even just to be apart of the action packed weekend. 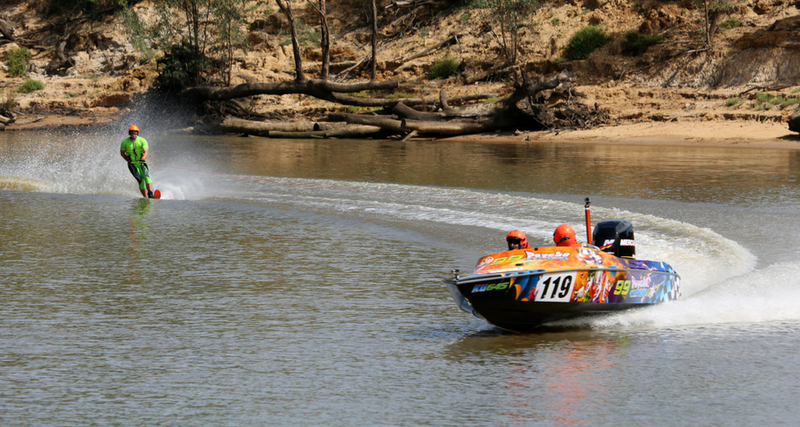 300 teams across both days hurl down the mighty Murray river, flying around super tight bends and reaching speeds in excess of200km/h. When I woke much earlier than my alarm on Saturday morning a whole wave of emotions hit me all at once. There was excitement, knowing that in only a few hours I was going to have the chance to be the first ever blind person to race in the Southern 80. Then there was the nerves. They hit me in the form of a range of different thoughts and feelings. Will I get up first go at the start of the race? What will the conditions be like? I hope my communication helmet doesn’t fail! I hope everything goes to plan! On top of all of that, there was everyone else around me wishing me luck and telling me how nervous they were for me. These emotions were going around and around in my head but I did my best to play it cool in front of everyone. Before too long, we were at the start line launching the boat with my team to get ready for take off. I was very lucky to have been apart of an awesome team, 99 Psycho Clowns, with Jess as my driver and Dan as my observer. Dan and Jess got their race suits on, I got my wet suit on and after a little bit of waiting around in line we were moving slowly towards the start line. My ski was strapped on tight, I had my communication helmet on and it had been checked, my goggles and gloves were on and we were ready to go. The 30 second horn went off which indicates that the skier needs to jump in the water and the boat needs to drive to the start line ready for the count down. Up until this point I had been fairly relaxed, enjoying the buzz of the start line and soaking up the atmosphere. Once I jumped off the nose of the boat everything changed. I had to concentrate and before I even had time to think, I heard Dan’s voice through my helmet counting me down. “5, 4, 3, 2, 1…”. The boat took off and as I was about to stand up when I let the tip of my ski sink under the water. I got pulled straight over the front of the ski and all of a sudden my ski handles were ripped from my hands and I was under water. Unbelievably, my ski, which I wear tighter than most, had flown all the way off my foot from the impact. Surfacing, I was gasping for air and starting to panic. I had no idea where my ski was, which direction I was facing in the river and, to add to all of that, I knew that there was another boat taking off behind me in less than 60 seconds. The frustration and disappointment started to take over my body and a big part of me wanted to give up there and then. The voice inside my head was saying that trying to ski in the Southern 80 without eyesight was a stupid idea to begin with and that I should just walk away. Sitting with that thought for a moment full of frustration I knew I had to switch my thinking quickly or else those emotions would take over. Reality then hit me again as I heard Dan’s calming voice in my helmet directing me to swim back to my left towards my ski, that they were coming around behind me and that we would go again just like we had practised so many times before. He was right and I knew it, I just had to shake my negative thoughts. Picturing everyone that had travelled to Echuca to cheer me on and everyone around the country that had supported me up until this point was all the motivation I needed to focus again. Deep inside I knew that I could do it. I wanted to do it so badly not only for me but for everyone out there to prove that they do not have to let their circumstances dictate what they can and cannot achieve in life. Holding on to those thoughts I strapped my ski back on, I pulled my goggles back over my eyes and in doing so realised that they were hollow with the lenses popping out when I crashed. Another obstacle that could have gotten in the way but I knew there was no point worrying about that now because Dan’s voice interrupted my thoughts again with a “3, 2, 1…”. The only way to get up and make it to the finish line was to see with Limitless Vision; to not let my visual impairment hold me back and just ski just how I had trained. We were off! I got up like I had done so many times before and within seconds we were racing down the Murray river towards the finish line. Tears were streaming from my face (only due to not having lenses in my goggles! ), my mouth had dried out from the hot air and the adrenalin was pumping as we reached speeds in excess of 130km/h. As I listened closely to every instruction Dan gave me, I could not help but to picture the crowds lining the banks all the way to the finish line. It was an amazing view and an even better feeling. It felt as if we were only just getting into it when I heard Dan say that we were coming around the last corner. There was that much adrenalin pumping through me, I could have skied another 20 kilometres! Only a few seconds after successfully navigating the final bend, Dan’s congratulations were in my ear and we crossed the finish line. The feeling was overwhelming and incredible. To know that I had just done what so many people had told me was impossible was awesome! I definitely could not have done any of this without Dan, Jess and the whole 99 Psycho Clowns team, my beautiful partner Amy who drove me to so many training days and weekends away and always believed in me, my Dad, Tim, for driving our family boat for so many kilometres during the freezing cold winter while I trained and to all my family and friends for all of their support as well. Also, the Moama Water Sports Club and Ski Racing Australia for being so willing to give me a go and have my back the entire way through, thank you. All in all skiing in the 2017 Southern 80 as the first ever blind person to do so was an amazing experience. After completing the race, I now believe, more than ever, that no matter what your situation is in life and what challenges and obstacles that throws your way, with Limitless Vision, anything is possible.